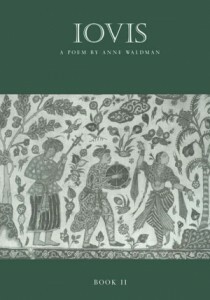 Performance-poet Waldman published the first volume of her dynamic and challenging Iovis epic in 1993. The 25 loosely organized sections of Book II address many of the same themes: male and female energy, history and mythology, mysticism, Eastern religion and contemporary politics. Employing poetry and prose, Waldman caroms from rare moments of startling vision to pages of uninspired lists (two pages of names of constellations) and sometimes incomprehensible meditations, as in “Sequel to a Sharp Turn,” in which she uses blank space and extended ellipses. Waldman is most accessible when she turns from her Beat-rooted brew of world travel and Eastern philosophy to the quotidian. Parts of “So Help Me Sappho,” for instance, are addressed to a modern-day mother who “writes in a Powerbook/ who drives a Volvo and adds chile to most of her dishes/ who beats her little boy with broom handles/ who demands some savvy/ who sneezes in Spring & buys sheets of stamps/ who folds the day into many hours….” Although often overwhelmingly abstract and disjunctive (“Mom, you’re so random,” a son reiterates), Iovis, Book II retains a firm hold on relevance with its accrual of talon-sharp details. An “open system” epic consisting of 23 “self-organizing” sections, Iovis (“All is full of Jove”) attempts to fuse numerous “leitmotifs”: dreams and out-of-body experiences; fathers and sons (Waldman’s father fought in World War II, and she studies religion with her son in Bali); gurus (John Cage, Jack Kerouac, and the Dalai Lama); men, or “seed syllables” (“the male gods take over as electricity and dynamite”); women (“I covered myself with the black silk chador better/ to hide this pulsating body of desire”); political concerns (arms control and human rights); shape-shifting and voices (“What is this identification with young men? Are they playful tricksters inside the hag?”); travel (she is almost killed by a terrorist attack in Rome); and opaque occult and heavy-metal imagery (she once “nibbled” psychotropic drugs). This ambitious attempt by our most exuberant performance poet to write a New Age “cohesive landscape” provides many pleasures but little contentment. It would be best heard aloud. All content © Anne Waldman, unless otherwise cited.